DESCRIPTION: A folded letter sheet franked by a handstamp similar in design to a single 1845 issue 10 cent black on bluish Baltimore Postmaster’s Provisional, postmarked with a blue Baltimore cds and a blue PAID handstamp, with also a blue manuscript 10 marking, addressed to Hagerstown, MD. APPARENT USAGE: Fully prepaid, double rate 5 cents per half ounce letter traveling less than 300 miles under domestic letter rates established July 1, 1845. ANALYSIS: This folded letter sheet is addressed to Elie Beatty in Hagerstown, MD and is part of the Hagerstown Bank “find,” a very prolific correspondence, readily available in the philatelic market. Inside the letter is a manuscript dateline: Balte Dec 8th 1841. The Baltimore Postmaster’s Provisional adhesive stamps and handstamped postal stationery envelopes were not issued until July 1845, more than three years after this folded letter was mailed. Furthermore, James M. Buchanan did not become postmaster of Baltimore until April 17, 1845, and was not postmaster during 1841 or any time prior to 1845. The cover is handstamped with the blue BALTIMORE Md/DEC 9 cds and blue PAID markings typical of an 1841 period letter from Baltimore and are genuine. In addition, the blue manuscript 10 is the correct rate for a single letter traveling from 31 to 80 miles according to the official rate schedule established in 1816/1825 and valid until July 1, 1845. The stamp design of the 10 cent Buchanan adhesive stamps (Scott 3X2 and 3X4) has the “James M. Buchanan” signature in a rectangular box, the dimensions of which are approximately 52mm x 11mm. The stamps were printed from a plate of 12 (2 x 6) containing nine 5 cent stamps and three 10 cent stamps. The handstamped 10 cent postal stationery envelopes (Scott 3XU3 and 3XU4), also issued in 1845, consist of a design that includes a handstamped signature (but not in a box), a handstamped PAID, and a handstamped numeral in oval, all applied separately. The unboxed handstamped signature is only known on postal stationery envelopes. The bogus handstamp on this folded letter is similar to the design of the stamps (3X2 and 3X4), not of the postal stationery envelope (3XU3). The dimensions of its rectangular box are approximately 51mm x 16mm. 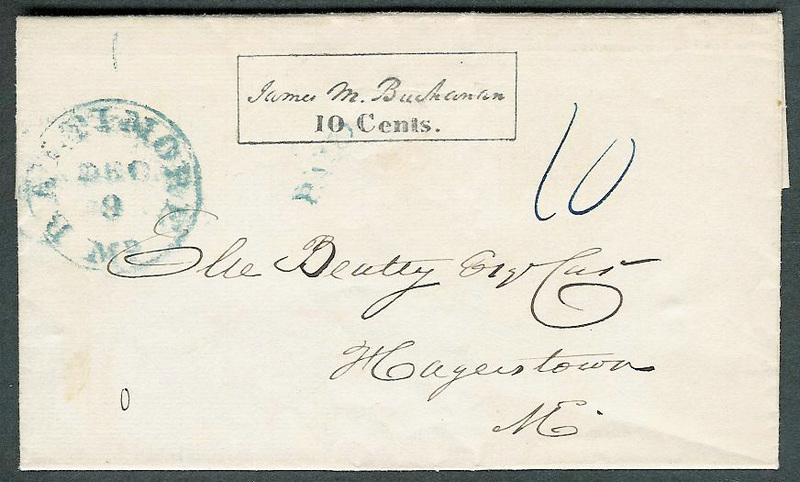 No generic Buchanan handstamp, with the signature of James M. Buchanan and a postal value within a rectangular box (i.e. similar to the adhesive stamp), is known. In 1946 the Baltimore Philatelic Society produced souvenir sheets which included replicas of the Buchanan 5 cent and 10 cent adhesive stamps. These might be the source of the faked handstamp on this folded letter sheet. The frame lines of each stamp on the souvenir sheet were a rectangle; however, on the original Buchanan stamps, the frame lines were crossed lines. (Although unconfirmed, it is rumored that the plates to produce the souvenir sheets may still exist.) The handstamp on this cover is very similar to the design used for the 10 cent stamp in the souvenir sheet, except that the dimensions of the frame differ, the design of the souvenir sheet frame being 2mm shorter. It should be noted that the exact measurements of the original stamps are not consistent from stamp to stamp because of the different papers used. Even from the same plate position, the frame size of a genuine stamp can vary by as much as a millimeter in length. CONCLUSION: This folded letter was originally a genuine 1841 stampless cover to which was added a bogus handstamp similar in design to the Baltimore Postmaster’s Provisional adhesive stamps of 1845.